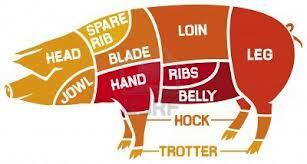 Which Part of the Pig to 'Sequester'? Examples of SEQUESTER-The jury was sequestered until a verdict was reached.He was sequestered in his room. Leave it to American politics to come up with a new definition of a word to describe what we do here versus the rest of the sane universe. The 1974 Budget and Impoundment Control Act was passed by Congress, not surprisingly when you think about it now with hindsight, to limit President Nixon's power to 'impound' or not spend money appropriated by Congress in the annual budget process. This bill was signed into law on July 12, 1974. President Nixon resigned in disgrace on August 9, 1974, less than 2 months later. No correlation between the two, of course. There has always been a tension between the Congressional power to spend tax money and executive power to veto Congressional spending and not spend tax money. Nixon wanted to 'impound' money from being spent on $12 billion in 'unworthy, wasteful programs' in his opinion in 1973-74 to help curtail then-considered 'explosive' federal spending and curb inflation fears. Congress wanted to cut his presidential power to do so. However, a Congress of 435 House Representatives and 100 Senators seems to be organically incapable of figuring out how to meet the needs, wants and desires of all elected officials and do so in a way that balances with tax revenue coming in the Treasury each year. So in 1985, Congress passed the Gramm-Rudman-Hollings Balanced Budget and Emergency Deficit Control Act which was the first bill to use the new power of 'sequester' to cut federal spending across-the-board with a meat cleaver if Congress and the President could not come to an agreement on the annual budget. We remember it vividly because it cut 10% out of the congressional budget we were operating under during the first year of the term of former Congressman Alex McMillan (R-NC) in Congress. Sequesters work. We had close to $100,000 cut out of our congressional office budget at the time which did not make our newly-hired staffers very happy I seem to recall. Sequesters since then have been mainly used as 'threats' to force deals to be cut in the legislative process. 'No one in their right mind would ever let such indiscriminate cuts happen!' has been the prevailing attitude since 1985. But that presumes that everyone in Congress and the Senate and the White House has a 'right mind' to begin with. As in a mind that can read and write, add and subtract, cogitate and persuade and aim towards a balanced budget, one of the most basic concepts of civilized societies that survive for any length of time. We have abject empirical proof in Washington for the past 13 years that there is not a working majority of 'right minds' in Congress and the White House, now don't we? If we did, we could have avoided ringing up a national debt now of $16 trillion...and counting; the financial collapse of 2008; a collapse in our public education systems across the nation and so on. Add your favorite peeve. The $85B in sequester cuts are less than the total economic impact of Hurricane Sandy and the Drought of 2012..and the American Republic and economy survived both of them. The $85B in sequester cuts represent a portion of the accumulated growth in federal spending that has been bottled up in 'future baseline projections' for the last 10 years. Reducing federal spending by $85B in sequester cuts this year will not take FY 2013 spending down below where it was for FY 2012. 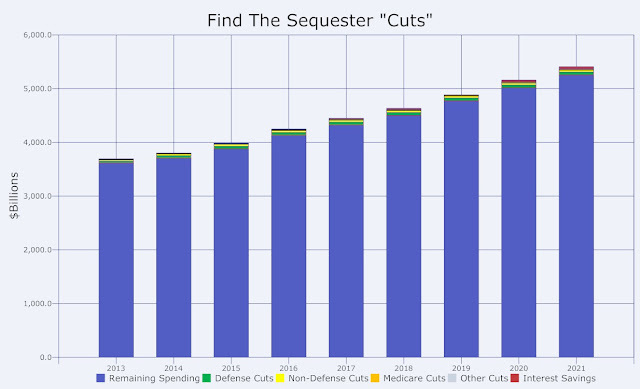 Invoking the sequester now will not cut a damn thing in absolute terms in future spending for the next 9 years! Every single year, federal spending will continue to increase over the previous fiscal year, except at a slightly lower rate of growth. Instead of averaging 6.5% annual growth, for example, federal spending would 'only' average perhaps 5.9% growth for the next 9 years after this sequester is enacted. Every year, the federal government would be spending more than the rate of inflation in the general economy. Suppose you like to drink a fifth of booze every single day this year. A 'Booze Sequester' of similar magnitude would reduce your intake to 98% of a fifth of booze per day until October 1 of this year, 2013. For FY 2014, instead of being able to consume 1 fifth of booze plus 7% of another fifth of booze per day, you will 'only' be able to consume 1 fifth of booze plus 6% of another fifth of booze. Per day. Your 'predicted' baseline increase of consumption of booze for the future will be reduced in similar percentages for the next 8 years. You will still be 'over-drinking' heavily...just not as much as you want to and hoped to before the Booze Sequester was passed by your spouse and family. Who would be rightly concerned about your consumption habits. Because they know that it will eventually lead to your mental, physical and spiritual demise. After not seeing any meaningful, real spending cuts come out of this White House in the last four years, and watching the 'fiscal cliff' deal culminate in what was essentially only a tax hike on those making over $400,000 then, which settled the 'fairness' debate in our book, we think the best thing to do is to see the sequester go into effect on March 1. It will be the first and only 'true' spending restraint seen come out of Washington in over a decade.